The Osage Nation (/ˈoʊseɪdʒ/ OH-sayj) (Osage: Ni-u-kon-ska, “People of the Middle Waters”) is a Midwestern Native American tribe of the Great Plains. The tribe developed in the Ohio and Mississippi river valleys around 700 BC along with other groups of its language family. They migrated west of the Mississippi after the 17th century due to wars with Iroquois invading the Ohio Valley from New York and Pennsylvania in a search for new hunting grounds. The nations separated at that time, and the Osage settled near the confluence of the Missouri and the Mississippi rivers. The term “Osage” is a French version of the tribe’s name, which can be roughly translated as “warlike”. The Osage people refer to themselves in their indigenous Dhegihan Siouan language as Wazhazhe, or “Mid-waters”. At the height of their power in the early 19th century, the Osage had become the dominant power in the region, feared by neighboring tribes. The tribe controlled the area between the Missouri and Red rivers, the Ozarks to the east and the foothills of the Wichita Mountains to the south. They depended on nomadic buffalo hunting and agriculture. The missionary Isaac McCoy described the Osage as an “uncommonly fierce, courageous, warlike nation” and said they were the “finest looking Indians I have ever seen in the West”. In the Ohio Valley, the Osage originally lived among speakers of the same Dhegihan language stock, such as the Kansa, Ponca, Omaha, and Quapaw. Researchers believe that the tribes likely became differentiated in languages and cultures after leaving the lower Ohio country. The Omaha and Ponca settled in what is now Nebraska, the Kansa in Kansas, and the Quapaw in Arkansas. In the 19th century, the Osage were forced to remove from Kansas to Indian Territory (present-day Oklahoma), and the majority of their descendants live in Oklahoma. In the early 20th century, oil was discovered on their land. Many Osage became wealthy through leasing fees generated by their headrights. However, during the 1920s, they suffered manipulation and numerous murders by whites eager to take over their wealth. In the 21st century, the federally recognized Osage Nation has ~20,000 enrolled members, 6,780 of whom reside in the tribe’s jurisdictional area. Members also live outside the nation’s tribal land in Oklahoma and in other states around the country, including Kansas. The Osage are descendants of cultures of indigenous peoples who had been in North America for thousands of years. Studies of their traditions and language show that they were part of a group of Dhegian-Siouan speaking people who lived in the Ohio River valley area, extending into present-day Kentucky. According to their own stories (common to other Dhegian-Siouan tribes, such as the Ponca, Omaha, Kaw and Quapaw), they migrated west as a result of war with the Iroquois and/or to reach more game. Scholars are divided as to whether they think the Osage and other groups left before the Beaver Wars of the Iroquois. Some believe that the Osage started migrating west as early as 1200 CE and are descendants of the Mississippian culture in the Ohio and Mississippi valleys. They attribute their style of government to effects of the long years of war with invading Iroquois. After resettling west of the Mississippi River, the Osage were sometimes allied with the Illiniwek and sometimes competing with them, as that tribe was also driven west of Illinois by warfare with the powerful Iroquois. Eventually the Osage and other Dhegian-Siouan peoples reached their historic lands, likely developing and splitting into the above tribes in the course of the migration to the Great Plains. By 1673, when they were recorded by the French, many of the Osage had settled near the Osage River in the western part of present-day Missouri. They were recorded in 1690 as having adopted the horse (a valuable resource often acquired through raids on other tribes.) The desire to acquire more horses contributed to their trading with the French. They attacked and defeated indigenous Caddo tribes to establish dominance in the Plains region by 1750, with control “over half or more of Missouri, Arkansas, Oklahoma, and Kansas,” which they maintained for nearly 150 years. They lived near the Missouri River. Together with the Kiowa, Comanche, and Apache, they dominated western Oklahoma. They also lived near the Quapaw and Caddo in Arkansas. The Osage held high rank among the old hunting tribes of the Great Plains. From their traditional homes in the woodlands of present-day Missouri and Arkansas, the Osage would make semi-annual buffalo hunting forays into the Great Plains to the west. They also hunted deer, rabbit, and other wild game in the central and eastern parts of their domain. The women cultivated varieties of corn, squash, and other vegetables near their villages, which they processed for food. They also harvested and processed nuts and wild berries. In their years of transition, the Osage had cultural practices that had elements of the cultures of both Woodland Native Americans and the Great Plains peoples. 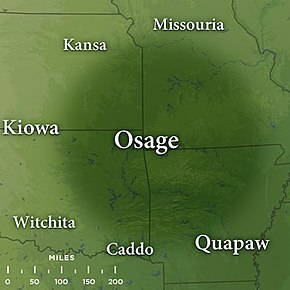 The villages of the Osage were important hubs in the Great Plains trading network served by Kaw people as intermediaries. In 1673 French explorers Jacques Marquette and Louis Joliet were among the first Europeans to encounter the Osage as they explored southward from present-day Canada in their expedition along the Mississippi River. Marquette and Joliet claimed all land in the Mississippi Valley for France. Marquette’s 1673 map noted that the Kanza, Osage, and Pawnee tribes controlled much of modern-day Kansas. The Osage called the Europeans I’n-Shta-Heh (Heavy Eyebrows) because of their facial hair. As experienced warriors, the Osage allied with the French, with whom they traded, against the Illiniwek during the early 18th century. The first half of the 1720s was a time of more interaction between the Osage and French. Étienne de Veniard, Sieur de Bourgmont founded Fort Orleans in their territory; it was the first European fort on the Missouri River. Jesuit missionaries were assigned to French forts and established missions to the Osage, learning their language. In 1724, the Osage allied with the French rather than the Spanish in their fight for control of the Mississippi region. In 1725, Bourgmont led a delegation of Osage and other tribal chiefs to Paris. The Native Americans were shown the wonders and power of France, including a visit to Versailles, Château de Marly and Fontainebleau. They hunted with Louis XV in the royal forest and saw an opera. During the French and Indian War (the North American front of the Seven Years’ War in Europe), France was defeated by Great Britain and in 1763 ceded its lands east of the Mississippi River to that nation. France made a separate deal with Spain, which took nominal control of much of the Illinois Country west of the great river. 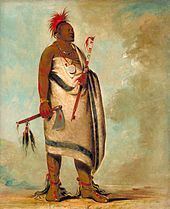 By the late 18th century, the Osage did extensive business with the French Creole fur trader René Auguste Chouteau, who was based in St. Louis; the city was part of territory under nominal Spanish control after the Seven Years’ War but was dominated by French colonists. They were the de facto European power in St. Louis and other settlements along the Mississippi, building their wealth on the fur trade. In return for the Chouteau brothers’ building a fort in the village of the Great Osage 350 miles (560 km) southwest of St. Louis, the Spanish regional government gave the Chouteaus a six-year monopoly on trade (1794–1802). The Chouteaus named the post Fort Carondelet after the Spanish governor. The Osage were pleased to have a fur trading post nearby, as it gave them access to manufactured goods and increased their prestige among the tribes. Lewis and Clark reported in 1804 that the peoples were the Great Osage on the Osage River, the Little Osage upstream, and the Arkansas band on the Verdigris River, a tributary of the Arkansas River. The Osage then numbered some 5,500. The Osage and Quapaw suffered extensive losses due to smallpox in 1801-1802. Historians estimate up to 2,000 Osage died in the epidemic. 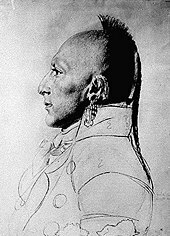 In 1804 after the United States made the Louisiana Purchase, they appointed the wealthy French fur trader Jean Pierre Chouteau, a half-brother of René Auguste Chouteau, as the US Indian agent assigned to the Osage. In 1809 he founded the Saint Louis Missouri Fur Company with his son Auguste Pierre Chouteau and other prominent men of St. Louis, most of whom were of French-Creole descent, born in North America. 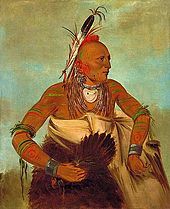 Having lived with the Osage for many years and learned their language, Jean Pierre Chouteau traded with them and made his home at present-day Salina, Oklahoma, in the western part of their territory. The Choctaw chief Pushmataha, based in Mississippi, made his early reputation in battles against the Osage tribe in the area of southern Arkansas and their borderlands. In the early 19th century, some Cherokee, such as Sequoyah, voluntarily removed from the Southeast to the Arkansas River valley under pressure from European-American settlement in their traditional territory. They clashed there with the Osage, who controlled this area. The Osage regarded the Cherokee as invaders. They began raiding Cherokee towns, stealing horses, carrying off captives (usually women and children), and killing others, trying to drive out the Cherokee with a campaign of violence and fear. The Cherokee were not effective in stopping the Osage raids, and worked to gain support from related tribes as well as whites. The peoples confronted each other in the “Battle of Claremore Mound,” in which 38 Osage warriors were killed and 104 were taken captive by the Cherokee and their allies. As a result of the battle, the United States constructed Fort Smith in present-day Arkansas. It was intended to prevent armed confrontations between the Osage and other tribes. The US compelled the Osage to cede additional land to the federal government in the treaty referred to as Lovely’s Purchase. In 1833, the Osage clashed with the Kiowa near the Wichita Mountains in modern-day south-central Oklahoma, in an incident known as the Cutthroat Gap Massacre. The Osage cut off the heads of their victims and arranged them in rows of brass cooking buckets. :33 Not a single Osage died in this attack. Later, Kiowa warriors, allied with the Comanche, raided the Osage and others. In 1836, the Osage prohibited the Kickapoo from entering their Missouri reservation, pushing them back to ceded lands in Illinois. After the US acquired Louisiana Territory in 1803, the government became interested in relations with the various tribal nations of the territory. President Thomas Jefferson commissioned the Lewis and Clark Expedition to survey the territory and report on its peoples, plants and animals, at the same time that it sought a route via the Missouri River to the Pacific Ocean. It encountered the Osage in their territory along the Osage River. The major part of the tribe moved to the Three-Forks region of what would become Oklahoma soon after the encounter with the Lewis and Clark Expedition, wanting to maintain distance from European Americans. They were buffered for a period from interaction with the United States settlers and representatives. This part of the tribe did not participate in negotiations for the treaty of 1808, but their assent was obtained in 1809. For instance, in September 1807, Lewis persuaded the Potawatomie and Sac and Fox to attack an Osage village; three Osage warriors were killed. The Osage blamed the Americans for the attack. 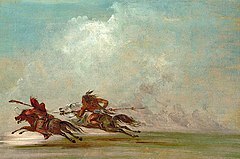 One of the Chouteau traders intervened, and persuaded the Osage to conduct a buffalo hunt rather than seek retaliation by attacking Americans. But the goal foremost pursued by the US was to push the Osage out of areas being settled by European Americans, who began to enter the Louisiana Territory after the US acquired it. The lucrative fur trade stimulated the growth of St. Louis and attracted settlers there. The US and Osage signed their first treaty on November 10, 1808, by which the Osage made a major cession of land in present-day Missouri. Under the Osage Treaty, they ceded 52,480,000 acres (212,400 km2) to the federal government. This treaty created a buffer line between the Osage and new European-American settlers in the Missouri Territory. It also established the requirement that the U.S. President had to approve all future land sales and cessions by the Osage. The Treaty of Ft. Osage states the U.S. would “protect” the Osage tribe “from the insults and injuries of other tribes of Indians, situated near the settlements of white people….”. As was common in Native American relations with the federal government, the Osage found that the US did not carry through on this commitment. The Osage also occupied land in present-day Kansas and in Indian Territory. In the 1830s the US government promised some of this land to the Cherokee and four other southeastern tribes under Indian Removal. When the Cherokee arrived to find that the land was already occupied, many conflicts arose with the Osage over territory and resources. Between the first treaty with the US and 1825, the Osages ceded their traditional lands across Missouri, Arkansas, and Oklahoma in the treaties of 1818 and 1825. In exchange they were to receive reservation lands and supplies to help them adapt to farming and a more settled culture. They were first relocated to a southeast Kansas reservation called the Osage Diminished Reserve. The city of Independence later developed here. The first Osage reservation was a 50 by 150-mile (240 km) strip. The United Foreign Missionary Society sent clergy to them, supported by the Presbyterian, Dutch Reformed, and Associate Reformed churches. They established the Union, Harmony, and Hopefield missions. Cultural differences often led to conflicts, as the Protestants tried to impose their culture. The Catholic Church also sent missionaries. The Osage were attracted to their sense of mystery and ritual, but felt the Catholics did not fully embrace the Osage sense of the spiritual incarnate in nature. During this period in Kansas, the tribe suffered from the widespread smallpox pandemic of 1837–1838, which caused devastating losses among Native Americans from Canada to New Mexico. All clergy except the Catholics abandoned the Osage during the crisis. Most survivors of the epidemic had received vaccinations against the disease. The Osage believed that the loyalty of Catholic priests, who stayed with them and also died in the epidemic, created a special covenant between the tribe and the Catholic Church, but they did not convert in great number. Honoring this special relationship, as well as Catholic sisters who taught their children on reservations, in 2014 numerous Osage elders went to St. Louis to celebrate the city’s 250th anniversary of the European founding. They participated in a mass partially conducted in Osage at St. Francis Xavier (College) Catholic Church of St. Louis University on April 2, 2014, as part of planned activities. One of the con-celebrants was Todd Nance, the first Osage ordained as a Catholic priest. In 1843 the Osage asked the federal government to send “Black Robes”, Jesuit missionaries to educate their children; the Osage considered the Jesuits better able to work with their culture than the Protestant missionaries. The Jesuits also established a girls’ school operated by the Sisters of Loretto from Kentucky. During a 35-year period, most of the missionaries were new recruits from Ireland, Italy, the Netherlands and Belgium. They taught, established more than 100 mission stations, built churches, and created the longest-running school system in Kansas. White squatters continued to be a frequent problem for the Osage, but they recovered from population losses, regaining a total of 5,000 members by 1850. The Kansas–Nebraska Act resulted in numerous settlers arriving in Kansas; both abolitionists and pro-slavery groups were represented among those trying to establish residency in order to vote on whether the territory would have slavery. The Osage lands became overrun with European-American settlers. In 1855, the Osage suffered another epidemic of smallpox, because a generation had grown up without getting vaccinated. Subsequent US treaties and laws through the 1860s further reduced the lands of the Osage in Kansas. During the years of the Civil War, they were buffeted by both sides, as they were located between Union forts in the North, and Confederate forces and allies to the South. While the Osage tried to stay neutral, both sides raided their territory, taking horses and food stores. They struggled simply to survive through famine and the war. During the war, many and Creek refugees from Indian Territory came to Osage country in Kansas, which further strained their resources. Although the Osage favored the Union by a five to one ratio, they made a treaty with the Confederacy to try to buy some peace. As a result, after the war, they were forced to make a new treaty with the US during Reconstruction. They were forced to give up more territory in Kansas to European-American settlers. By a treaty in 1865, they ceded another 4 million acres (16,000 km2) to the United States and were facing the issue of eventual removal from Kansas to Indian Territory. In 1867, Lt. Col. George Armstrong Custer chose Osage scouts in his campaign against Chief Black Kettle and his band of Cheyenne and Arapaho Indians in western Oklahoma. He knew the Osage for because of their scouting expertise, excellent terrain knowledge, and military prowess. Custer and his soldiers took Chief Black Kettle and his peaceful band by surprise in the early morning near the Washita River on November 27, 1868. They killed Chief Black Kettle, and the ambush resulted in additional deaths on both sides. This incident became known as the Battle of Washita River, or, better, as the Washita massacre, an ignominious part of the United States’ Indian Wars. Following the American Civil War and victory of the Union, the Drum Creek Treaty was passed by Congress July 15, 1870 during the Reconstruction era and ratified by the Osage at a meeting in Montgomery County, Kansas, on September 10, 1870. It provided that the remainder of Osage land in Kansas be sold and the proceeds used to relocate the tribe to Indian Territory in the Cherokee Outlet. By delaying agreement with removal, the Osage benefited by a change in administration. They sold their lands to the “peace” administration of President Ulysses S. Grant, for which they received more money: $1.25 an acre rather than the 19 cents previously offered to them by the US. 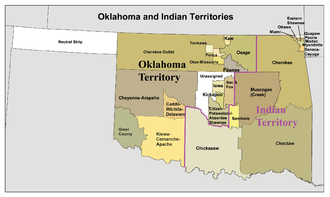 Oklahoma and Indian Territory map, circa 1890s, created using Census Bureau Data. The Osage were one of the few American Indian nations to buy their own reservation. As a result, they retained more rights to the land and sovereignty. The reservation, of 1,470,000 acres (5,900 km2), is coterminous with present-day Osage County, Oklahoma in the north-central portion of the state between Tulsa and Ponca City. The Osage established three towns: Pawhuska, Hominy and Fairfax. Each was dominated by one of the major bands at the time of removal. The Osage continued their relationship with the Catholic Church, which established schools operated by two orders of nuns, as well as mission churches. It was many years before the Osage recovered from the hardship suffered during their last years in Kansas and their early years on the reservation in Indian Territory. For nearly five years during the depression of the 1870s, the Osage did not receive their full annuity in cash. Like other Native Americans, they suffered from the government’s failure to provide full or satisfactory rations and goods as part of their annuities during this period. Middlemen made profits by shorting supplies to the Indians or giving them poor-quality food. Some people starved. Many adjustments had to be made to their new way of life. During this time, Indian Office reports showed nearly a 50 percent decline in the Osage population. This resulted from the failure of the US government to provide adequate medical supplies, food and clothing. The people suffered greatly during the winters. While the government failed to supply them, outlaws often smuggled whiskey to the Osage and the Pawnee. In 1879, an Osage delegation went to Washington, DC and gained agreement to have all their annuities paid in cash; they hoped to avoid being continually shortchanged in supplies, or by being given supplies of inferior quality – spoiled food and inappropriate goods. They were the first Native American nation to gain full cash payment of annuities. They gradually began to build up their tribe again, but suffered encroachment by white outlaws, vagabonds, and thieves. By the start of the 20th century, the federal government and progressives were continuing to press for Native American assimilation, believing this was the best policy for them. Congress passed the Curtis Act and Dawes Act, legislation requiring the dismantling of other reservations. They allotted communal lands in 160-acre portions to individual households, declaring the remainder as “surplus” and selling it to non-natives. As the Osage owned their land, they were in a stronger position than other tribes. The Osage were unyielding in refusing to give up their lands and held up statehood for Oklahoma before signing an Allotment Act. They were forced to accept allotment, but retained their “surplus” land after allotment to households, and apportioned it to individual members. Each of the 2,228 registered Osage members in 1906 (and one non-Osage) received 657 acres, nearly four times the amount of land (usually 160 acres) that most Native American households were allotted in other places when communal lands were distributed. 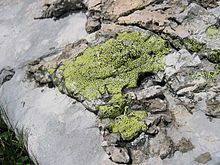 In addition, the tribe retained communal mineral rights to what was below the surface. As development of resources occurred, members of the tribe received royalties according to their headrights, paid according to the amount of land they held. In 1906, the Osage Allotment Act was passed by U.S. Congress, as part of its effort to extinguish Native American tribal rights and structure, and to prepare the territories for statehood as Oklahoma. In addition to breaking up communal land, the Act replaced tribal government with the Osage National Council, to which members were to be elected to conduct the tribe’s political, business, and social affairs. Although the Osage were encouraged to become settled farmers, their land was the poorest in the Indian Territory for agricultural purposes. They survived by subsistence farming, later enhanced by stock raising. They discovered they were fortunate to have lands covered with the rich bluestem grass, which proved to be the best grazing in the entire country. They leased lands to ranchers for grazing and earned income from the resulting fees. They are the only tribe since the early 20th century within the state of Oklahoma to retain a federally recognized reservation. In 2000 the Osage sued the federal government over its management of the trust assets, alleging that it had failed to pay tribal members appropriate royalties, and had not historically protected the land assets and appreciation. The suit was settled in 2011 for $380 million, and a commitment to make numerous changes to improve the program. In August 2016 the Osage nation bought Ted Turner‘s 43,000-acre (17,000 ha) Bluestem ranch. In 1889, the US federal government claimed to no longer recognize the legitimacy of a governing Osage National Council, which the people had created in 1881, with a constitution that adopted some aspects of that of the United States. In 1906, as part of the Osage Allotment Act, the US Congress created the Osage Tribal Council to handle affairs of the tribe. It extinguished the power of tribal governments in order to enable the admission of the Indian Territory as part of the state of Oklahoma. Under the Act, initially each Osage male had equal voting rights to elect members of the Council, and the principal and assistant principal chiefs. Because the Osage owned their land, they negotiated under the Allotment Act to keep their communal land, above the then-common allotment which the government was making of 160 acres per person. They allocated this land as well, so that each of the 2,228 Osage members and one non-Indian on the 1906 tribal roll received 657 acres. The rights to these lands in future generations was divided among legal heirs, as were the mineral headrights to mineral lease royalties. Under the Allotment Act, only allottees and their descendants who held headrights could vote in the elections or run for office (originally restricted to males). The members voted by their headrights, which generated inequalities among the voters. A 1992 US district court decision ruled that the Osage could vote in a process to reinstate the Osage National Council as city members of the Osage nation, rather than being required to vote by headright. But, this decision was reversed in 1997 with the United States Court of Appeals ruling that ended the government restoration. In 2004 Congress passed legislation to restore sovereignty to the Osage Nation and enable them to make their own decisions about government and membership qualifications for their people. In March 2010, the United States Court of Appeals for the Tenth Circuit held that the 1906 Allotment Act had disestablished the Osage reservation established in 1872. This ruling potentially affected the legal status of three of the seven Osage casinos, including the largest one in Tulsa, as it meant the casino was not on federal trust land. Federal Indian gaming law allows tribes to operate casinos only on trust land. The Osage Nation’s largest economic enterprise, Osage Casinos, officially opened newly constructed casinos, hotels and convenience stores in Skiatook and Ponca City in December 2013. In the late 19th century, the Osage discovered oil on their reservation lands. This resource generated great wealth through the 1920s for people who held headrights. In 1894 large quantities of oil were discovered to lie beneath the vast prairie owned by the tribe, land which had been unsuitable for the subsistence farming urged by the federal government. Because of his recent work in developing oil production in Kansas, Henry Foster, a petroleum developer, approached the Bureau of Indian Affairs (BIA) to request exclusive privileges to explore the Osage Reservation in Oklahoma for oil and natural gas. The BIA granted his request in 1896, with the stipulation that Foster was to pay the Osage tribe a 10% royalty on all sales of petroleum produced on the reservation. Foster found large quantities of oil, and the Osages benefited greatly monetarily. But this discovery of “black gold” eventually led to more hardships for tribal members. In preparation for statehood, the US government pressed the Osage to accept allotment and end tribal government. Before having a vote within the tribe on the question of allotment, the Osage demanded that the government purge their tribal rolls of people who were not legally Osage. The Indian agent had been adding names of persons who were not approved by the tribe, and the Osage submitted a list of more than 400 persons to be investigated. Because the government removed few of the fraudulent people, the Osage had to share their land and oil rights with people who did not belong. The US Congress passed the Osage Allotment Act on June 28, 1906. Because the Osage owned their land, they kept control of it all. The government made the allocation of land extremely complicated, in a way that prevented most Osage from owning contiguous parcels. This was intended to increase their incentive to sell or lease portions of land, and the takers were mostly whites. But, the Osage had negotiated keeping communal control of the mineral rights. The act stated that all persons listed on tribal rolls prior to January 1, 1906 or born before July 1907 (allottees) would be allocated a share of the reservation’s subsurface natural resources, regardless of blood quantum. The headright could be inherited by legal heirs. This communal claim to mineral resources was due to expire in 1926. After that, individual landowners would control the mineral rights to their plots. This provision heightened the pressure for those whites who were eager to gain control of Osage lands before the deadline. Although the Osage Allotment Act protected the tribe’s mineral rights for two decades, any adult “of a sound mind” could sell surface land. In the time between 1907 and 1923, Osage individuals sold or leased thousands of acres to non-Indians of formerly restricted land. At the time, many Osage did not understand the value of such contracts, and often were taken advantage of by unscrupulous businessmen, con artists, and others trying to grab part of their wealth. Non-Native Americans also tried to cash in on the new Osage wealth by marrying into families with headrights. Alarmed about the way the Osage were using their wealth, in 1921 the US Congress passed a law requiring any Osage of half or more Indian ancestry to be appointed a guardian until proving “competency”. Minors with less than half Osage ancestry were required to have guardians appointed, even if their parents were living. This system was not administered by federal courts; rather, local courts appointed guardians from among white attorneys and businessmen. By law, the guardians provided a $4000 annual allowance to their charges, but initially the government required little record keeping of how they invested the difference. Royalties to persons holding headrights were much higher: $11,000–12,000 per year during the period 1922–1925. Guardians were permitted to collect $200–1000 per year, and the attorney involved could collect $200 per year, which was withdrawn from each Osage’s income. Some attorneys served as guardians and did so for four Osage at once, allowing them to collect $4800 per year. The guardianship program created an incentive for corruption, and many Osage were legally deprived of their land, headrights, and/or royalties. Others were murdered, in cases the police generally failed to investigate. The coroner’s office colluded by falsifying death certificates, for instance claiming suicides when people had been poisoned. The Osage Allotment Act did not entitle the Native Americans to autopsies, so many deaths went unexamined. The tribe auctioned off development rights of their mineral assets for millions of dollars. According to the Commissioner of Indian Affairs, in 1924 the total revenue of the Osage from the mineral leases was $24,670,483. After the tribe auctioned mineral leases and more land was explored, the oil business on the Osage reservation boomed. Tens of thousands of oil workers arrived, more than 30 boom towns sprang up and, nearly overnight, Osage headright holders became the “richest people in the world.” When royalties peaked in 1925, annual headright earnings were $13,000. A family of four who were all on the allotment roll earned $52,800, comparable to approximately $600,000 in today’s economy. In the early 1920s there was a rise in murders and suspicious deaths of Osage, called the “Reign of Terror”, and the Osage Indian Murders. In one plot, in 1921, Ernest Burkhart, a European American, married Molly Kyle, an Osage woman with headrights. His uncle William “King of Osage Hills” Hale, a powerful business man who led the plot, and brother Byron hired accomplices to murder Kyle family heirs. They arranged for the murders of Molly Kyle’s mother, two sisters and a brother-in-law, and a cousin, in cases involving poisoning, bombing, and shooting. With local and state officials unsuccessful at solving the murders, in 1925 the Osage requested the help of the Federal Bureau of Investigation. It was the bureau’s first murder case. By the time it started investigating, Molly Kyle was already being poisoned. This was discovered and she survived. She had inherited the headrights of the rest of her family. The FBI achieved the prosecution and conviction of the principals in the Kyle family murders. From 1921-1925, however, an estimated 60 Osage were killed, and most murders were not solved. John Joseph Mathews, an Osage, explored the disruptive social consequences of the oil boom for the Osage Nation in his semi-autobiographical novel Sundown (1934). As a result of the murders and increasing problems with trying to protect Osage oil wealth, in 1925 Congress passed legislation limiting inheritance of headrights only to those heirs of half or more Osage ancestry. In addition, they extended the tribal control of mineral rights for another 20 years; later legislation gave the tribe continuing communal control indefinitely. Today, headrights have been passed down primarily among descendants of the Osage who originally possessed them. But the Bureau of Indian Affairs (BIA) has estimated that 25% of headrights are owned by non-Osage people, including other American Indians, non-Indians, churches, and community organizations. It continues to pay royalties on mineral revenues on a quarterly basis. Beginning in 1999, the Osage Nation sued the United States in the Court of Federal Claims (dockets 99-550 and 00-169) for mismanaging its trust funds and its mineral estate. The litigation eventually included claims reaching into the 19th century. In February 2011, the Court of Federal Claims awarded $330.7 million in damages in partial compensation for some of the mismanagement claims, covering the period from 1972 to 2000. On October 14, 2011, the United States settled the outstanding litigation for a total of $380 million. The tribe has about 16,000 members. The settlement includes commitments by the United States to cooperate with the Osage to institute new procedures to protect tribal trust funds and resource management. The Osage Tribal Council was created under the Osage Allotment Act of 1906. It consisted of a principal chief, an assistant principal chief, and eight members of the Osage tribal council. The mineral estate consists of more than natural gas and petroleum. Although these two resources have yielded the most profit, the Osage have also earned revenue from leases for the mining of lead, zinc, limestone, and coal deposits. Water may also be considered a profitable asset that is controlled by the Mineral Council. The first elections for this council were held in 1908 on the first Monday in June. Officers were elected for a term of two years, which made it difficult for them to accomplish long-term goals. If for some reason the principal chief’s office becomes vacant, a replacement is elected by the remaining council members. Later in the 20th century, the tribe increased the terms of office of council members to four years. In 1994 by referendum, the tribe voted for a new constitution; among its provisions was the separation of the Mineral Council, or Mineral Estate, from regular tribal government. According to the constitution, only Osage members who are also headright holders can vote for the members of the Mineral Council. It is as if they were shareholders of a corporation. The Osage wrote a constitution in 1881, modeling some parts of it after the United States Constitution. The Osage Allotment Act of 1906, mentioned in more detail under the previous section Natural Resources and Headrights, provided for election of a principal chief, assistant principal chief and an eight-member tribal council as the recognized governing body of the Osage Tribe. Each allottee received 657 acres (2.66 km2) of surface rights and mineral rights were reserved to the Osage Tribe. Only allottees and their descendants with headrights, considered shareholders, could vote or run for office in the tribe. Over generations, headrights and votes became highly fractionated. By a new constitution of 1994, the Osage voted that original allottees and their direct descendants, regardless of blood quantum, were citizen members of the Nation. Due to court challenges, this constitution was overruled. At the time of allotment, the Osage had challenged some of the allottees listed by the Bureau of Indian Affairs, but the BIA had never cleaned up their records according to the tribal position. Later this challenge was brought up again. The Reform Commission held weekly meetings to develop a referendum that Osage members could vote upon in order to develop and reshape the Osage Nation government and its policies. On March 11, 2006, the people ratified the Constitution in a second referendum vote. Its major provision was to provide “one man, one vote” to each citizen of the nation. Previously, based on the allotment process, persons voted proportionally as shareholders. By a 2/3 majority vote, the Osage Nation adopted the new constitutional form of government. It also ratified the definition of membership in the Nation. Today, the Osage Nation has 13,307 enrolled tribal members, with 6,747 living within the state of Oklahoma. Since 2006 it has defined membership based on a person’s lineal descent from a member listed on the Osage Rolls at the time of the Osage Allotment Act of 1906. A minimum blood quantum is not required. But, as the Bureau of Indian Affairs restricts federal education scholarships to persons who have 25% or more blood quantum in one tribe, the Osage Nation tries to support higher education for its students who do not meet that requirement. The tribal government is headquartered in Pawhuska, Oklahoma and has jurisdiction in Osage County, Oklahoma. The current governing body of the Osage nation contains three separate branches; an executive, a judicial and a legislative. These three branches parallel the United States government in many ways. The tribe operates a monthly newspaper, Osage News. The Osage Nation has an official website and uses a variety of communication media and technology. The judicial branch maintains courts to interpret the laws of the Osage Nation. It has the power to adjudicate civil and criminal matters, resolve disputes, and judicial review. The highest court is the Supreme Court. This Supreme Court has a Chief Justice, currently Meredith Drent, who replaced former Chief Justice Charles Lohah. There is also a lower Trial Court and more inferior courts as allowed by the tribal constitution. The executive branch is headed by a Principal Chief, followed by an Assistant Principal Chief. The current Principal Chief is Geoffrey Standing Bear, and Raymond Red Corn is the Assistant Principal Chief, who were both sworn in on July 2, 2014. Administrative offices also fall under this executive branch. The legislative branch consists of a Congress that works to create and maintain Osage laws. In addition to this role, their mission is to preserve the checks and balances within the Osage government, carry out oversight responsibilities, support trial revenues, and preserve and protect the nation’s environment. This Congress is made up of twelve individuals who are elected by the Osage constituency and serve four-year terms. They hold two regular Congressional sessions and are headquartered in Pawhuska. The Osage Nation issues its own tribal vehicle tags and operates its own housing authority. The tribe owns a truck stop, a gas station, and ten smoke shops. In the 21st century, it opened its first gaming casino and as of December 2013, has seven casinos. Casinos are located in Tulsa, Sand Springs, Bartlesville, Skiatook, Ponca City, Hominy and Pawhuska. The tribe’s annual economic impact in 2010 was estimated to be $222 million. Osage Million Dollar Elm, the casino management company, is encouraging employees in education, paying for certificate classes related to their business, as well as for classes leading to BA and master’s business degrees. Located in Pawhuska, Oklahoma, the Osage Nation Museum provides interpretations and displays of Osage history, art, and culture. The continuously changing exhibits convey the story of the Osage people throughout history and celebrate Osage culture today. Highlights include an extensive photograph collection, historical artifacts, and traditional and contemporary art. John Joseph Mathews, an Osage, explored the adverse social effects of the oil boom for the Osage Nation in his semi-autobiographical novel Sundown (1934). Laura Ingalls Wilder wrote a series of children’s books, known as Little House on the Prairie (1932–1943). The novel Little House on the Prairie and its TV adaptation are based on her family’s pioneer days in Kansas. They squatted on Osage land and encountered members of the tribe. Monte Blue (1887–1963), American actor of the silent and sound eras. Louis F. Burns (1920–2012), historian and author, a leading expert on Osage history, customs, and mythology. Charles Curtis, Vice-president of the United States under Herbert Hoover, a descendant of Osage chief Pawhuska. Guy Erwin (b. 1958), first openly gay bishop in the Evangelical Lutheran Church in America (elected 31 May 2013). David Holt (politician), serves in the Oklahoma State Senate; he is the first Osage elected to state office since 2006. William Least Heat-Moon (b. 1939), professor of English and best-selling author. John Joseph Mathews (c. 1894–1979), author and historian of the Osage Nation; World War I veteran. Elise Paschen, poet and daughter of Maria Tallchief. Sacred Sun, a 19th-century Osage woman who was among a group taken to France. Larry Sellers, healer, actor, linguistic mentor. Maria Tallchief, classical ballerina with the New York City Ballet; contributed greatly to the success of ballet as a dance art in the United States. Marjorie Tallchief, professional ballerina. Both sisters were prima ballerinas who performed in many countries throughout the 20th century. Clarence L. Tinker (1887–1942), US Army aviation officer who died during World War II while on a Pacific combat mission during the Japanese attack on Midway Island in June 1942. Achieved rank as major general. ^ La Flesche, Francis (1932). A Dictionary of the Osage Language. US Government Printing Office. p. 110. ^ “The Osage”. Fort Scott National Historic Site. National Park Service. Archived from the original on March 8, 2009. Retrieved February 25, 2009. ^ “Osage Nation Membership”. Osage Nation official website. Retrieved 13 May 2018. ^ “Today in History: January 29”. Lcweb2.loc.gov. Retrieved 2016-02-20. ^ Foreman, Grant (March 1924). “The Three Forks”. The Chronicles of Oklahoma. 2 (1): 38. Retrieved 3 June 2015. ^ Swanton, John (1931). “Source Material for the Social and Ceremonial Life of the Choctaw Indians”. Smithsonian Institution Bureau of American Ethnology Bulletin (103). ^ Jones, Charlie; Mike Bouch (November 1987). “Sharing Choctaw History”. Bishinik. University of Minnesota. Archived from the original on January 23, 2007. Retrieved November 29, 2006. ^ Boyd, Maurice (1981): Kiowa Voices. Ceremonial Dance, Ritual and Song. Fort Worth. ^ Warrior, Robert Allen. 2005. The People and the Word, Minneapolis: University of Minnesota Press. ^ “Osage Mission-Neosho County Museum”. Osagemission.org. Retrieved 2016-02-20. ^ a b c Warrior, Robert Allen. The People and the Word: Reading Native Nonfiction. Minnesota: University of Minnesota Press, 2005. (80-81) Print. ^ Warrior, Robert Allen. The People and the Word, p. 54. ^ Warrior, The People and the Word, p. 87. ^ Clifton Adcock, “Ruling raises stakes: Some casinos deemed not on protected land”, Tulsa World, 12 April 2010. ^ “Osage Casino Hotel in Skiatook opens”, Tulsa World, 10 December 2013. ^ “Minerals Council”. Osage Nation. 2014-06-09. Retrieved 2017-10-23. ^ Affairs, United States Congress House Committee on Indian (1922). Modifying Osage Fund Restrictions: Hearing Before the Committee on Indian Affairs, Sixty-Seventh Congress, Second Session on H.R. 10328. February 15-Mar. 31, 1922. U.S. Government Printing Office. ^ Burns, Louis F. A History of the Osage People, New York: University Alabama, 1989/2004. ^ “Tom’s Inflation Calculator”. Halfhill.com. Retrieved 2016-02-20. ^ “United States and Osage Tribe Announce $380 Million Settlement of Tribal Trust Lawsuit”. Retrieved 2012-07-06. ^ “US to Pay $1 Billion Settlement to Indian Tribes”. The New York Times. Retrieved 2016-02-20. ^ a b Hokiahse Iba, Priscilla. “Osage Government Reform” Archived 2011-07-26 at the Wayback Machine, Arizona Native Net, 2006. Retrieved on 2009-10-05. ^ “Osage Nation holds inauguration for new chief and other leaders”. Indianz.Com. 2014-07-03. Retrieved 2016-02-20. ^ Polacca, Benny. “Osage actor stars in cable TV movie this year.” Archived 2013-05-21 at the Wayback Machine Osage News. 7 March 2011. Retrieved 30 June 2013. ^ “OHS Publications Division”. Digital.library.okstate.edu. Archived from the original on 2013-06-07. Retrieved 2016-02-20. Terry P. Wilson, The Underground Reservation: Osage Oil, Lincoln: University of Nebraska Press, 1985.